The Roy at Overland, a mixed-use housing project in West Los Angeles’ Palms neighborhood, is finished and is open to the public. 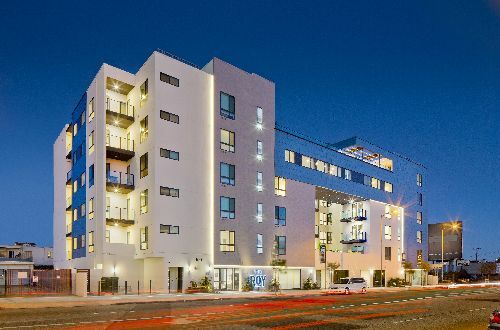 The 92-unit complex was developed by Anejo Development LLC and Griffin Opportunities LLC, and designed by Santa Monica-based architecture firm KFA. The Roy at Overland occupies a half-acre site at 3644-3658 Overland Ave, between Venice Blvd and the I-10 Fwy. The six-story, 81.7k sf development features a mix of studio, one- and two-bedroom apartments, including eight units of low-income housing; 1.5k sf of ground-floor retail space; and underground parking for 105 vehicles. The project also include a rooftop deck with a BBQ, while a movie screen area bridges a large, three-story opening at the center of the project. Special amenities include a gym, a community room, a large landscaped courtyard at the second level, and a dog run. The project replaces a series of one-story commercial structures. “We are excited about the completion of this fresh, contemporary building that adds much-needed housing, as well as an interesting focal point, to a fast-gentrifying neighborhood,” said KFA Partner Barbara Flammang, AIA. ”The interlocking elements of the dramatic exterior of The Roy at Overland are punctuated by a large opening in the facade that reveals part of its inviting, second-level interior courtyard to passers-by,” she added.